Log in your Citibank Online account. At the top menu, select "Services" then select "Card Services". 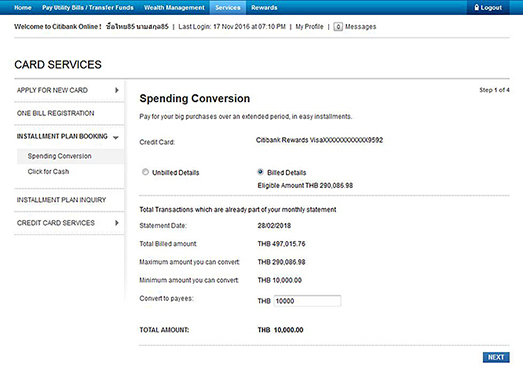 At the left navigation menu, select "Installment Plan Booking", then select "Spending Conversion". Choose your conversion amount, then click "Next". Step 2: Choose your preferred tenor and interest rate. Step 3: Verify and confirm your selected spending conversion. Step 4: Click "Done" to complete transaction. 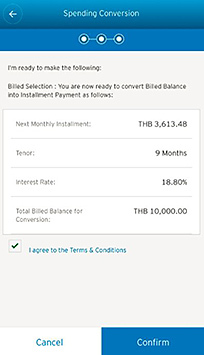 At the left navigation menu, select "Manage your credit", then select "Spending Conversion". Step 4: Your transaction is completed. Citi credit card member can also convert transactions into monthly installment via CitiPhone Banking at 0-2788-75180-2788-7518. If you receive an SMS regarding spending conversion after swiping your Citi credit card, you can simply follow provided URL and convert your transaction into monthly installment at your fingertips. applying through any other means determined by the Bank. Approval of the participation in the Program and loan amount is subject to the Bank's sole discretion. Once the loan is approved, the Bank shall transfer the loan only to the Participant's account designated by the Participant. The Participant agrees and accepts that the Participant receives such loan from the Bank correctly and completely at the time of the transfer. The loan that the Participant receives from this Program including any interest and fee is part of credit limit of Citi Credit Card/Citi Ready Credit. Repayment for the loan under this Program is subject to terms and conditions stipulated herein and in a letter of Program approval (credit advice) including Terms and Conditions of Using Citi Credit Card/Citi Ready Credit, loan agreement for Citi Ready Credit, and any other relevant terms/agreements as well as any amendments, alterations and addendums thereof as determined by the Bank. The Participant agrees not to use the loan received from this Program to repay any other loans or obligations owed to the Bank, nor invest in any investment product or any other financial products of the Bank and/or its affiliates. Otherwise, the Bank reserves the right to take any action per the Bank's policy and law including cancellation of the Program and the Participant must pay all expenses from the actions. This Program is not participating in Citi Rewards point program. The Participant shall not receive any Citi Rewards point from this Program. The installment amount consists of principal, interest and fee due in the cycle. The interest due for the first tenor shall be calculated from the approval date to the cycle cut date. The interest calculation for the remaining tenors shall be calculated from the previous cycle cut date to the next cycle cut date. The principle and interest shall be monthly charged into the Participant's Citi Credit card/Citi Ready Credit account during the entire period of the Program. In case the Participant does not make a full repayment for the outstanding amount due or does not make a repayment of the amount required by the Program within the due date, the Participant shall be liable for the interest at the applicable maximum rate and any other applicable fees and expenses incurred whatsoever as a result of the Participant's default, as announced by the Bank in compliance with the applicable notifications of the Bank of Thailand. In case the Participant makes any payment in the amount greater than the specified installment amount billed in the relevant month, the Participant shall not receive any interest on the excessive amount ("excess payment"). The excess payment shall remain as a credit in the Participant's Citi Credit Card/Citi Ready Credit account and shall not be applied to the outstanding principle, interest, and/or any other fees of the Program which are not due. The due date of the Program for installment repayments shall be the same due date of the Participant's Citi Credit Card/Citi Ready Credit. The Participant shall make the first installment repayment within the due date specified in the Participant's Citi Credit Card/ Citi Ready Credit statement for the cycle in which the Participant is granted an approval of participation in the Program. The Participant acknowledges that the due date of the first installment repayment may be more or less than 30 days from the approval date. 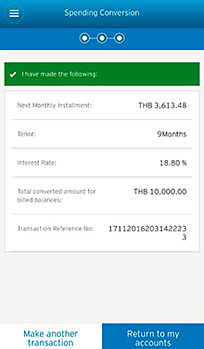 The Participant can pay off all outstanding amount owed to the Bank under this Program prior to the completion of the installment period at any time by informing the Bank in advance in writing or through CitiPhone Banking 1588 and pay off such outstanding amount and/or any other fees occurred. For the Program that the Bank charges the Participant for cash advance fee (subject to value-added tax), the Participant can pre-terminate the Program without a pre-termination fee. 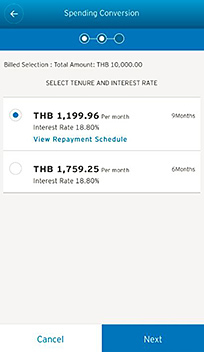 For the Program without cash advance fee, the Participant shall pay for the pre-termination fee which is calculated from the interest difference between the interest under the Program that the Participant has paid to the Bank and the applicable maximum interest that the Bank normally charges from Citi Credit Card holder/Citi Ready Credit customer, which is calculated on the entire amount from the approval date to the date the Bank receives repayment for all outstanding amount. However, such pre-termination fee shall be waived if installment has been paid 12 or more of the statement cycles. The excess payment in Clause 10. can be applied as a part of payoff amount. The Participant agrees to repay all outstanding amount owed including interest and fee to the Bank in full immediately upon the termination of the Participant's Citi Credit Card/Citi Ready Credit. The Bank reserves the rights to add, amend, and make any change toany and all of the terms and conditions of the Program by informing the Participant with 30-day prior notice. The terms and conditions of the Program shall not supersede the terms and conditions of Citi Credit Card/Citi Ready Credit. If not defined otherwise, the terms used herein shall have the same meaning as used in the terms and conditions of Citi Credit Card/Citi Ready Credit. 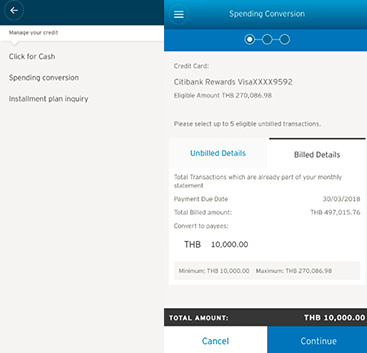 Citi credit card members can convert any retail spending above THB 4,000 into monthly installment. However, you can bundle up your spending into THB 4,000 or more. Citi credit card members can simply convert your retail spending into monthly installment via Citibank Online, Citi Mobile, CitiPhone Banking or SMS initiated by the bank. Click here to learn how to convert your spending. What is the Spending Conversion Program? Spending Conversion allows you to convert your retail spending via Citi credit card into monthly installment with special interest rates. What is the minimum amount for the Spending Conversion Program? THB 4,000 or indicated otherwise. Can I combine more than one spending to reach the minimum threshold? 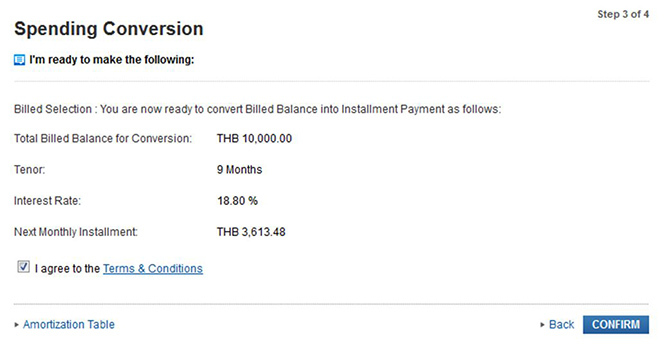 Yes, as long as your combined amount is at least THB 4,000 or indicated otherwise. How can I convert my spending? SMS only for those who receive an SMS from Citibank. What are the differences between Spending Conversion Program and PayLite Program? You can enroll in the PayLite Program at the point of sale with participated merchants only. However, the Spending Conversion Program allows you to convert your transactions anytime after you have purchased products or services at any stores. In addition, you can also choose your preferred tenor at 6, 9, 18, 24, or 36 months with special interest rates via the Spending Conversion Program. Are there any other fees apart from interest rates when participating in the Spending Conversion Program? No, there is no additional fee occurred from the Spending Conversion Program enrollment. Why didn't I receive any SMS regarding the Spending Conversion Program? 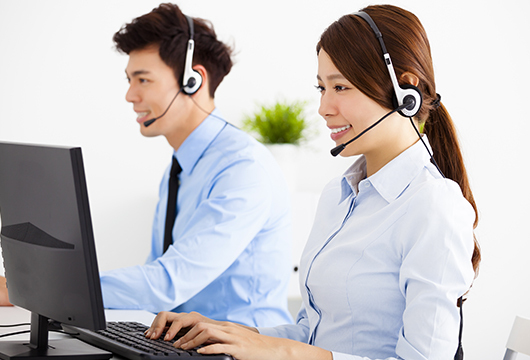 We will send SMS to preselected clients only. However, you can also convert your transactions via Citibank Online, Citi Mobile, or CitiPhone Banking. Approval of the participation in the program and the conversion amount are subject to the Bank’s sole discretion. instalments with special offer, click. Convert your spending from wide range of needs, either education expenses, long vacation, shopping, or other emergency matters, into our affordable monthly installment plan. You can convert your retail spending into monthly installment via 4 different channels, all at your fingertips. Click here to see installment example for Credit cardmember. Don't know how to convert your spending? Simply proceed with your fingertips within 1 minute. Don't have Citibank online account yet? Apply now for free within 3 minute simply by having card with you. Don't have Citi Credit card and Ready Credit yet? Receive approval results within 5 working days. Wondering what are the current Citi credit card promotions? Want our representatives to call back? *Only qualified customer will be contacted. Approval is subject to Citibank's sole discretion.